Hair and beauty salon on the High Street. It opened in early 2017. It was previously a hearing aid specialists called Amplifon photo, but this moved to 36 George Street around June/July 2015 photo of sign. The premises were vacant as of July 2015, and still vacant as of December 2015 and September 2016. 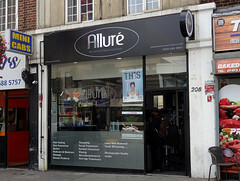 As of January 2017 it looked like new furniture was being installed inside photo, and by March 2017 a new hair and beauty salon called Allure was open. Last edited 2019-02-07 16:17:57 (version 42; diff). List all versions. Page last edited 2019-02-07 16:17:57 (version 42).